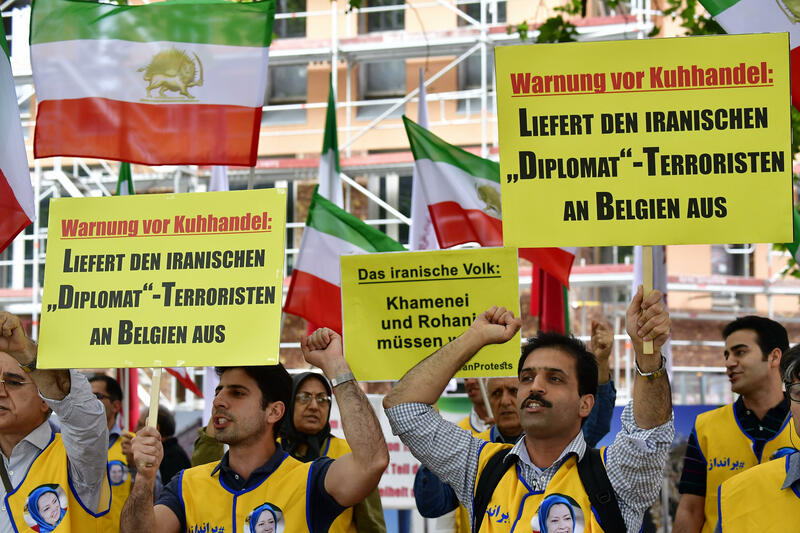 BERLIN -- An Iranian diplomat is suspected of involvement in a bomb plot against an Iranian opposition rally in France. Assadollah Assadi was charged in Germany on Wednesday with activity as a foreign agent and conspiracy to commit murder. Assadi, a Vienna-based diplomat, is suspected of contracting a couple in Belgium to attack an annual meeting of an exiled Iranian opposition group in Villepinte, near Paris, German federal prosecutors said. In their statement, German prosecutors allege that Assadi, who has been registered as a diplomat at the Iranian Embassy in Vienna since 2014, was a member of the Iranian intelligence service "Ministry of Intelligence and Security," whose tasks "primarily include the intensive observation and combatting of opposition groups inside and outside of Iran." U.S. Secretary of State Mike Pompeo accused Iran of using its embassies to plot extremist attacks in Europe and warned Tehran that its actions have "a real high cost" after it threatened to disrupt Mideast oil supplies. "Just this past week there were Iranians arrested in Europe who were preparing to conduct a terror plot in Paris, France. We have seen this malign behavior in Europe," Pompeo said Tuesday in an interview with Sky News Arabia during a short trip to the United Arab Emirates. German prosecutors said their investigation wouldn't hinder Belgium's extradition request for the suspect. Meanwhile, an Iranian who resides in Belgium and was detained in France agreed on Wednesday to be turned over to Belgian authorities, who had issued a European arrest warrant, a French judicial official told the Associated Press. The suspect, identified as Mehrdad Arefani, 54, will be handed over within 10 days, and go before an investigating magistrate there, according to the official, who wasn't authorized to speak publicly in an ongoing case and asked not to be identified.